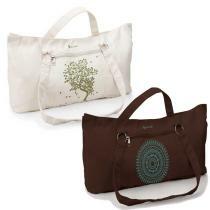 Gaiam’s Yoga Mat Totes are 100% cotton and fully lined in nylon fabric. Will fit any standard or premium Yoga or Pilates mat up to 28″ wide. Features magnetic snaps (for easy access when you’re running a little late to yoga class) along with a zippered outside pocket and a zippered inside pocket. The Marrakesh Tote features delicate sky blue detail on a rich cocoa background while the Tree of Life Tote is embroidered in rich detail with the Tree of Life, which is a multi-branched tree that illustrates the idea of interconnectedness of all living things on the planet.